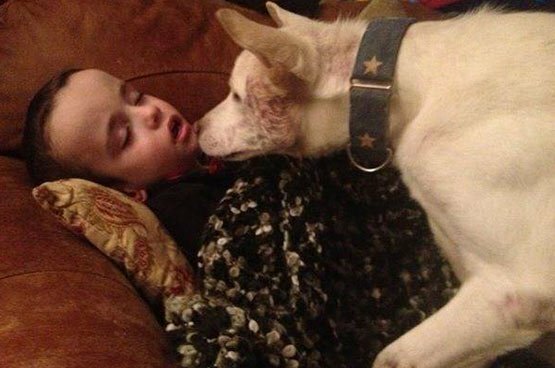 Phuket, Thailand (13th March 2015) – The amazing bond between a severely disabled 6 year old boy and his Thai rescue dog was recognised on Sunday 8th March at the world’s most famous dog show, Crufts. “Miracle”, rescued from Thailand’s illegal dog meat trade and adopted by the Leask family in Strathglass, Scotland, beat nearly 200 other dogs to win the prestigious Crufts Eukanuba Friends for Life award. Yet just two years ago, things looked much different for the Thai crossbreed. Miracle was snatched from the streets of north east Thailand, and loaded onto a truck with hundreds and hundreds of other stolen dogs, all destined for the dog meat restaurants of Hanoi in Vietnam. Luckily for Miracle, the truck carrying him to what would have been a slow and agonisingly painful death was intercepted by agents working for the Phuket-based Thai animal welfare charity Soi Dog Foundation, who’ve been fighting the illegal trade for the past four years. The dogs were taken to a purpose built shelter in north east Thailand, and adopters were sought. Amanda Leask spotted Miracle’s photo shortly after he’d been rescued on a Soi Dog Facebook post. Devastated by his plight and the hopelessness of his situation, she enquired about adopting him. Already an owner of three rescue dogs from Soi Dog, Amanda very soon had her fourth. 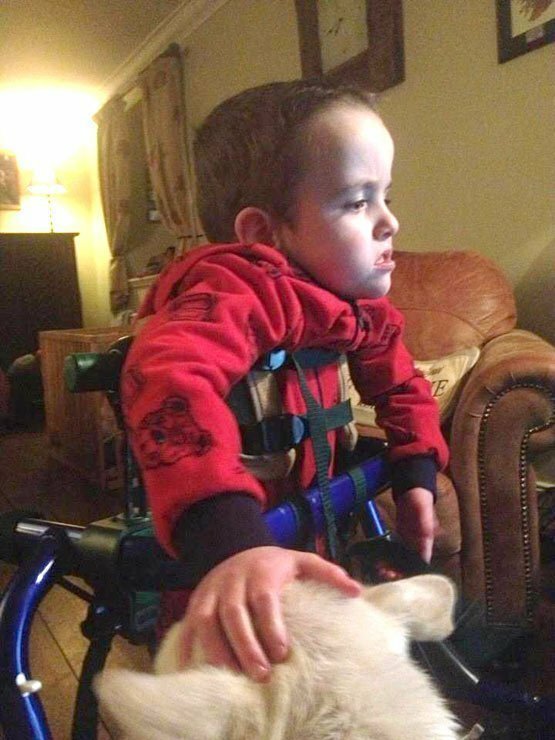 Amanda’s son Kyle, 6, was born with cerebral palsy, and was later diagnosed with autism. It is incredibly difficult for him to communicate with his family. Amanda decided to adopt some small dogs to be company for him, having heard that autistic people can develop extremely close relationships with dogs. Miracle is the latest of them, but it’s Kyle and Miracle who have developed a remarkably close bond, where there appears to be a complete unspoken mutual understanding. As Amanda says: “They’ve both faced so much hardship in their lives, it’s like there’s an unspoken language between them. When Kyle gets upset because he can’t convey what he wants to, Miracle will go and lay at his side for Kyle to touch and stroke. Miracle seems to automatically know when Kyle needs him”. Amanda added: “If Kyle simply wants some attention, Miracle will go over and shower him with kisses. And it works the other way too. Kids can build up confidence in dogs where they seek solace, and Miracle gets this in abundance from Kyle”. Miracle won £1,500 for his Crufts award, and Amanda will share the money between Soi Dog Foundation and the Autistic Society. If you would like to adopt a Thai dog meat trade rescue dog, please visit www.soidog.org for details. About Soi Dog Foundation: Soi Dog Foundation, a not-for-profit organisation established in 2003, is a legally registered charity in Thailand, the United States, Australia, the UK, France and Holland. Our mission statement is to improve the welfare of dogs and cats in Asia, resulting in better lives for both the animal and human communities, to create a society without homeless animals, and to ultimately end animal cruelty. John Dalley, co-founder and vice president, is available for interview. 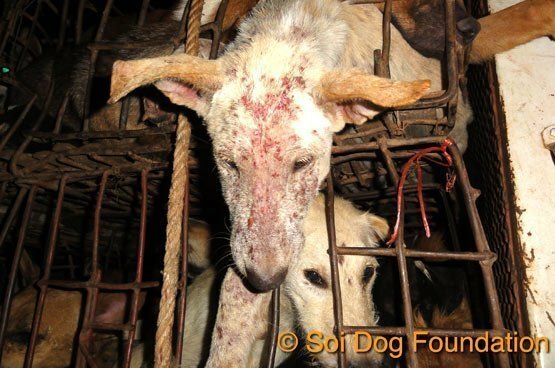 For more information please visit www.soidog.org or www.facebook.com/SoiDogPageInEnglish.